Browns RB Duke Johnson still makes sense for the Eagles, even after the Jordan Howard trade. A week ago when the Philadelphia Eagles traded a ham sandwich for former Chicago Bears running back Jordan Howard, they immediately improved what was (generously) a bottom five group of NFL running backs. Howard is a durable early down back who should help the Eagles significantly in specialized areas such as the red zone and in short yardage situations. Also, while it's not his role (nor should it be), he is also probably a better pass catcher than he is given credit for, and he's sturdy in pass protection. However, the Eagles should be far from done in addressing the running back position, as they still need a reliable player who can catch the ball out of the backfield. 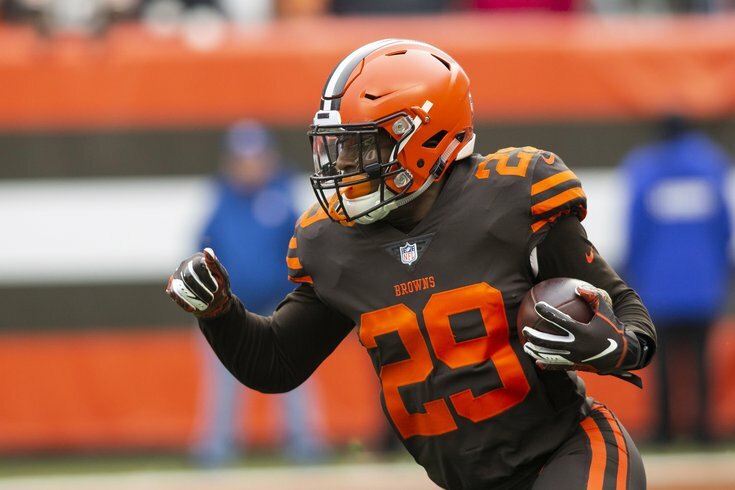 The player rumored to be on the Eagles' radar for the better part of the offseason has been Browns running back Duke Johnson, initially in early March, and then again earlier this week. According to Mary Kay Cabot of Cleveland.com, Johnson wants to be traded, and again, the Eagles were named as team that at one point reached out about acquiring him. The acquisition of Howard should not make the Eagles any less interested in Johnson, as he brings an entirely different set of skills to the table. As we noted recently, Johnson would be a nice fit in the Eagles' offense, and in my view, an upgrade over what Darren Sproles was giving the Birds in their offense. Over the weekend, Sproles indicated that it was his decision whether he would be back with the team or not, as in, if he wants to come back, the Eagles would have him back. That seems crazy, given that Sproles has missed 23 regular season games (26 including the playoffs) over the last two seasons, and is turning 36 in June. He is the type of player who should be viewed as a last resort, as opposed to a viable part of the plan for a Super Bowl contender. Johnson, on the other hand, is only 25, and he would have a palatable* contract, post-trade. On just under 300 career carries (about 75 per season), Johnson has run for 4.3 yards per carry in his career with the Browns, in what has (mostly) been a horrific offense. Just as importantly, Johnson has proven so far that he can stay on the field, as he has never missed a game in his four-year NFL career. But wouldn't Johnson just be another player similar to Corey Clement? In my view, no. While Clement certainly had some great moments during the Eagles' Super Bowl run, he regressed in his second season with the team, albeit while dealing with some injuries. Still, even if he were coming off his Super Bowl performance, it would be prudent for the Eagles not to overrate a small sample size. Yes, Clement made a great catch in the Super Bowl, however, he has 32 catches in 27 regular season games. Johnson has 235 catches in 64 games. That's 1.2 catches per game vs. 3.7 per game. Johnson is a far more accomplished and experienced pass catcher out of the backfield. "The three running backs who played in the Super Bowl were all guys we acquired after the 2017 draft," Roseman said last Tuesday. "Well, we won a Super Bowl with three guys we got after the draft," Pederson repeated the next morning. Yeah, OK, except that the Browns signed Johnson's replacement in Kareem Hunt, and general manager John Dorsey has already traded a boatload of players from the former regime, including Emmanuel Ogbah, Kevin Zeitler, Jabrill Peppers, Carlos Hyde, Josh Gordon, Shon Coleman, Corey Coleman, Jamar Taylor, Kevin Hogan, Cody Kessler, Jason McCourty, DeShone Kizer, and Danny Shelton. While Johnson's situation is perhaps a little different in that Dorsey gave him a contract extension last offseason, it is still rather clear that he is not in the team's long-term plans. The Eagles aren't stupid. They know that Johnson can be had, and probably at a cheap price. Conversely, the Browns aren't stupid either, and they can very clearly see that the Eagles' best receiving options out of the backfield are a 36-year old who can't stay healthy and a recent undrafted free agent who probably has a torn ACL. Of course, the Eagles can take a guy from a weak running back class in the 2019 draft. Maybe they strike gold there, or maybe they end up with another Donnel Pumphrey. The Eagles' M.O., however, despite the notion that they "won a Super Bowl with three guys they got after the 2017 draft," has been to fill holes with competent veterans prior to the draft, allowing them to be true to their board and not have to reach for positional needs. Make no mistake. A pass catching running back remains a significant need, and while a trade for Johnson shouldn't prohibit continuing to address the position in the draft, it would help solidify what is currently a pretty glaring hole. *Regarding Johnson's "palatable" contract, a number of people have disagreed, citing that he is currently the 11th highest-paid RB in the league, in terms of AAV, at $5,203,333/year. That is entirely misleading, as the Browns would eat a chunk of that. Yes, Johnson signed a three year, $15.6 million contract extension with the Browns last season, which equals out to $5.2 million per season. However, if he were traded, his salary cap numbers over the next three seasons with his new team would be $1.8 million in 2019, $3.6 million in 2020, and $4.65 million in 2021, with $500K of bonuses he would receive each year as long as he works out and stays on the roster. It is also my understanding that his new team could release him without penalty at any time after they traded for him.